Is there a way for a Policy Admin to create a new report for a user? There are multiple times when I, as a Policy Admin, are reviewing employees reports and I want to separate the transactions into two different reports based on month, but since it is the only open report the employee, it does not allow me to create a new report and submit the expenses from the old month for them. @Jenica That is correct. Auto-Report will only create a new report if there are no other open reports. Admins don't have the ability to create new reports if the user has other open reports available to add expenses to. I can see how it would be useful feature. Here on the community you’ll find a category named “Ideas” to share your feature request. After you do, other Expensify users will be able to vote on the idea and we can gauge the demand for it.The most popular ideas will be reviewed by our team and have a real chance of being placed on our roadmap. Hi @Jenica, Expensify is very much a user-driven tool, but there is one way that an Admin can create a new report and that's via the Company Card Reconciliation Dashboard, for company credit card transactions only. You can't separate a report or move transactions from one report to another, just create a report/add unreported transactions to an existing report. Are the transactions from a company card? Jenica has a great question, but I do not understand the response. How does an admin create a new report via the Company Card Dashboard? Hi @Donald_18 Welcome to the Expensify Community! 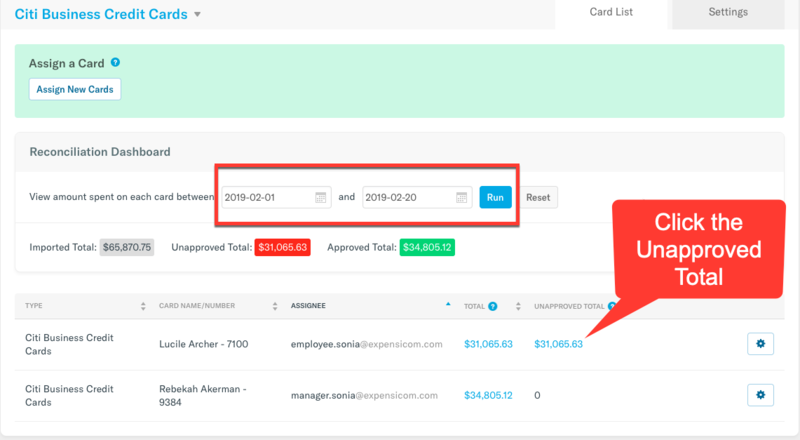 From the Company Card Reconciliation Dashboard the Domain Admin can select the statement date range (or any range) and hit Run. They can then click through into the Unapproved Total, filter by Unreported, select all and Add to Report. If there is an existing user report, the expenses will add to this. If one does not exist, the system will create it. Thank you RachCHopkins for your response. I have used the feature to create a new report from the reconciliation dashboard before, but there are limitations to this feature. It only allows you to create a report if all other reports are closed. If there are any open reports, it forces you to add the expenses to the open report. I would love the ability to add expenses to a new report either from the reconciliation dashboard or from the report tab. I have a situation where there are some older expenses which need to be separated onto a newly created report so that we can administratively push it through without forcing the reporting of current charges. If the expenses are in a state where they're Open, do you have a suggestion on how the Policy Admin can create a new report and add those charges to it?